White head and body, with light grey wings and back. Yellow bill with red spot in summer (a target for chicks to peck and trigger their parents to regurgitate food). A large gull, but not as big or bulky as the Great Black-backed Gull. One of the most common and widespread gulls in North America. Our only black-headed gull, the Laughing Gull is easy to identify. Its black head contrasts sharply with its white body and grey wings. Listen carefully and you'll learn how it got its name! Terns are more agile, acrobatic fliers that dive head-first into the water to catch their prey. The common tern is the largest on Long Island. It's identified by a black-capped head and orange bill. Most of the birds we wrongly identify as “seagulls” fall into the family Laridea, a large collection of web-footed seabirds comprised of gulls, terns, skuas and skimmers. In all, this family contains nearly fifty species in North America, about twenty of which can be found on Long Island. Not exactly an easy group to get a quick handle on! To make matters worse, this group is one of the most notoriously difficult to learn in the birding world. For starters, many of these birds take several years to acquire their adult breeding plumage (unlike many songbirds, on the other hand, that are sexually mature as one-year-olds). This means young birds may go several seasons without looking much like the adults of the same species. I’m sure you’ve seen these youngsters at the beach – they’re the spotty, brownish looking birds with no obvious feather pattern. The task of mastering “seagulls” is further complicated by local variations, feather aging and hybridization between species. But don’t despair, identifying our common gulls is not as challenging as it may seem. Let’s start by taking the immature birds off the table – even expert birders have trouble with these brownish youngsters. And while we’re at it, lets take the rare and uncommon birds off the table, too. As I mentioned, if you really make the effort you can find close to twenty different “seagulls” on the island, but many of these occur infrequently or only in isolated locations. When it comes down to it, you can do fairly well around the Great South Bay and other waterways around Long Island by learning about six different species; four gulls and two terns. Sure, you may encounter other “seagulls” from time to time that you won’t know, but these six birds will account for most of the birds you’ll see on and around the water this summer. So let’s start with the gulls. There are three “white-headed” gulls and one “hooded” gull, all of which are relatively easy to identify. Let’s take the white-headed gulls first in order of size from largest to smallest. Our largest “seagull” is the Great Black-backed Gull. This is a huge, lumbering bird with a wingspan that can exceed five feet. They are easily identified as the biggest, most assertive gulls on the beach. In fact, they’ve been described as “aggressive, predatory, merciless tyrants.” As adults, they have all-white heads, chests and bellies, with starkly contrasting dark wing and back feathers. The next of the white-headed gulls is the Herring Gull, one of the most common and widespread of all North American gulls. This is another large gull, but it’s not as big or as bulky as the great black-backed. While it has a similar white head and body, its wings and back are a much lighter grey. One recognizable thing about both Great Black-back and Herring Gulls is the bright red spot they develop on the lower part of their bills during the summer. Interestingly, this spot is used as a target for chicks to peck, which triggers their parents to regurgitate food for them to eat. The third and smallest of the white-headed gulls is the Ring-billed Gull. 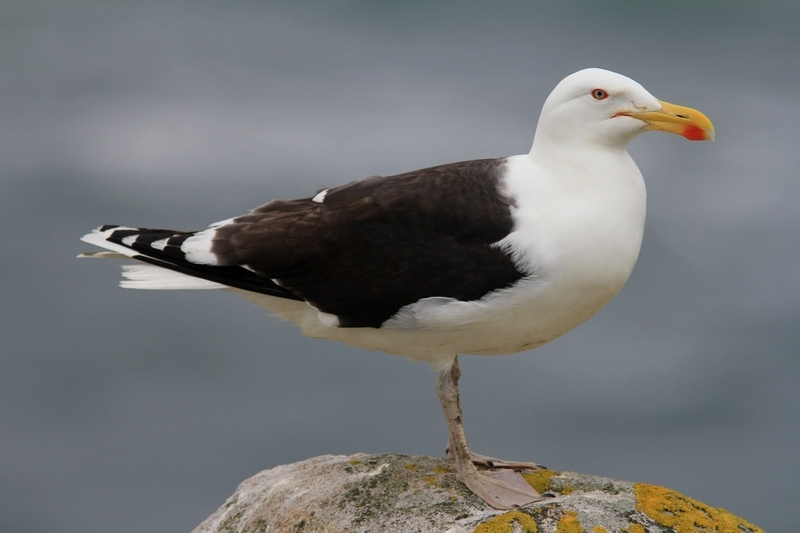 This is an extremely widespread bird that John James Audubon referred to as “the common American gull.” It is very similar in appearance, but somewhat smaller than the Herring Gull. The most obvious difference, as its name suggests, is the dark black ring around the front of its yellow bill. 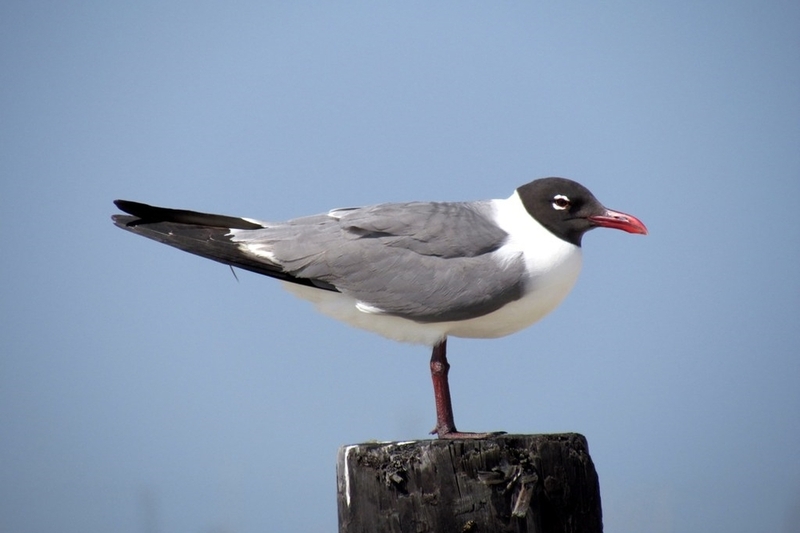 The fourth common gull in our area is the Laughing Gull. It is easily distinguished from the three other previous gulls: in summer, the adults have a dark black head that starkly contrasts with its white neck and body. The wings are slate gray with jet-black wingtips. Okay, so that’s the gulls. Pretty simple, right? One’s huge with a white head and black back (Great Black-backed); one’s big with a white head and light gray back (Herring); there’s a smaller white-headed one with a ring around its bill (Ring-billed); and one has an all-black head (Laughing). That’s it! Now there are two terns to add to your list and we’re done. Terns are closely related to gulls, but are much different in appearance. They’re smaller, sleeker, and more angular. They have shorter necks, more narrow bills, and long, slender wings. They’re also more graceful and acrobatic in flight than gulls. And, most notably, they generally feed by diving head first into the water to catch small fish and can often be seen hovering or “kiting” over the water looking for prey. While there are six tern species that can found on Long Island, only two are reliable everywhere – the Common Tern and the Least Tern. 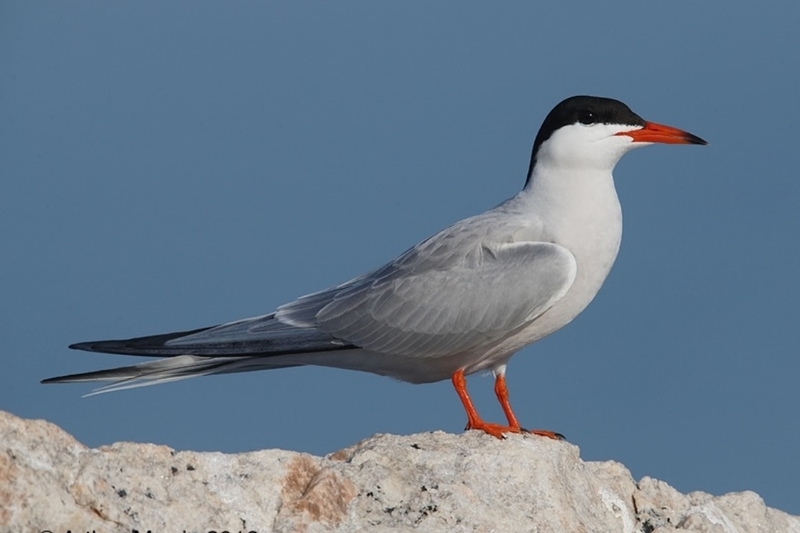 These birds are nearly identical in appearance with one stark difference … the Common Tern is much bigger. If you get a good look there are two other differences to aid in identification. First, Common Terns have an all black head; least terns have black heads with a large white forehead patch. Second, Common Terns have orange bills; Least Terns have yellow bills. The Least Tern, you may notice, is the bird that is featured in Seatuck’s logo. Several decades ago, soon after the organization was founded, Seatuck scientists played a critical role in documenting the bird’s declining population and helped to obtain regulatory protections to safeguard its future. So there you have it, a quick and simple guide to the common “seagulls” of the Long Island – four gulls and two terns. If you get these six birds figured out, there are a dozen or so others to learn and a world of subtle differences and distinctions to master! Enjoy the birds as you soak up your summer (but please don’t call them seagulls)! Want to help a child learn our common "seagulls"? Download Seatuck's children's Guide to Coastal Birds here.